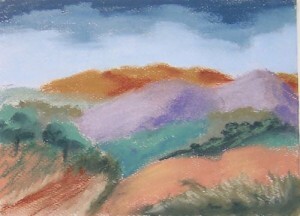 This entry was posted on Saturday, March 5th, 2011 at 5:24 pm	and is filed under 100 Pastel Challenge, Color, Landscapes, Paintings, Pastels. You can follow any responses to this entry through the RSS 2.0 feed. You can leave a response, or trackback from your own site. Thanks, but to be honest, most of the paintings are really meant to be weird combinations to break out of the run we get ourselves into when we paint the same subject all the time. It’s still nice to know that the purple does it’s thing! I especially like the sky in this one! Good going, girl!